PRIMA MATERIA; ALCHEMICAL THINKING AND MAKING IN ART, DESIGN AND MUSIC. The FIBER team retrieved its inspiration for this years theme by fascinating over connections between todays experimental art/design practices and a renewed interest in the ancient field of alchemy. Through an extensive program of conference talks, a public exhibition, AV performances, and live electronic music, the festival explores the theme Prima Materia; alchemical thinking and making in art, design and music. Prima Materia showcases artists and designers who question and reimagine the relationship between man, technology and matter. Technology has a profound effect on nature and we’re in great need to create a sustainable and more emotional relation with the earth. At the same time it is getting harder and harder to predict our future as a human race in the context of fast technological developments of things like artificial intelligence, big data and decentralised networks – developments that feel almost like organic, all-encompassing forces of nature. The human scale and the tools that we use to interpret the world are being radically transformed. We seem to be caught in the middle of invisible forces. Instead of responding with either apathetic paranoia or euphoric tech dreams, the artists in Prima Materia look for new ways of dealing with technology that have remarkable similarities with the centuries-old practice of alchemy. Alchemists – spread across Europe, Asia and parts of the Middle East – sought to discover the design of the universe. They experimented and speculated with the raw materials of the earth, searching for the so-called prima materia: the metaphysical substance that was said to connect everything in the cosmos. Two hypotheses were central to the practice of alchemy: the transmutation of regular metals into rare metals – gold being the holy grail – as well as the creation of artificial life (the Homunculus). In secret laboratories and with self-built instruments, irrational work processes were embraced. 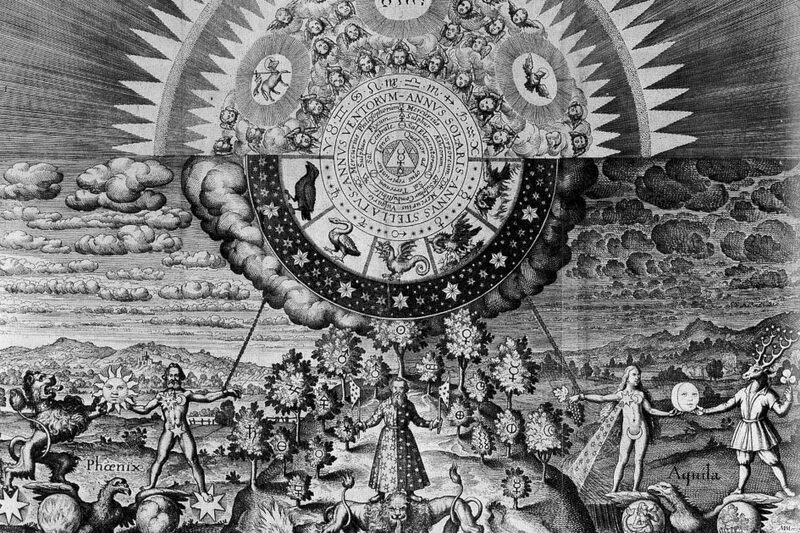 Alchemy was the search for the blueprint of nature and the position of mankind between the stars and the soil. At the beginning of the 17th century, the era of alchemy reached its end, making way for modern science. The tradition of over 4,000 years old got dismissed as being a mystical, irrational pseudoscience. An inscrutable method of gathering knowledge, documented in mystical symbols, coded recipes and tables. Nowadays, however, the academic world once again entertains a central role for practices of alchemy: it appears to be an unmistakable interdisciplinary predecessor of modern science and the development of our material knowledge. Simultaneous to this reassessment of alchemy, FIBER sees interesting connections to contemporary experimental art practices. Artists, designers, coders and engineers, offer speculative perspectives on our relation with synthetic, digital and natural materials. They experiment with new ways of learning about hybrid materials (between biological, synthetical and virtual), question the building blocks of the digital revolution, visualise the transmutation of data in gold (capital) and research the relationships between our human ways and artificial life; the irrational black boxes of algorithms, bots and artificial intelligence. In short, these artists try to penetrate the matter of these technologies and speculate on their impact, just like the alchemists did. Prima Materia shows a search through the transmutation of 21st-Century materials through artistic instruments and speculative imaginations of our future. Which transmutations are we capable of? What position does mankind have in the dynamics of the earth, cosmos, and the relentless whirlwind that is the digital revolution? States of Matter – new ways to look at matter. Artificial Perception – ways to broaden our perspective on the world through programmed and intelligent instruments. New Ecologies – speculates about a future in which we experience the connections between technology, nature and the universe in new ways.